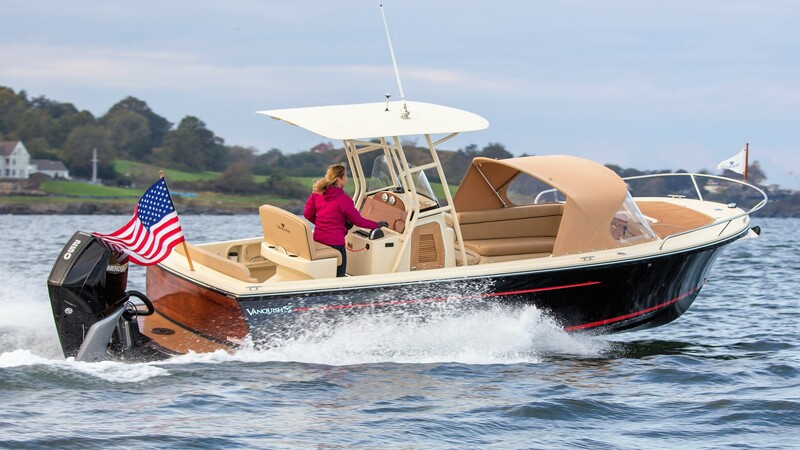 In its new 43z, MJM Yachts offers the cruising comforts of its unique, high tech downeast designs along with the sporty handling, enhanced speed and shoal water versatility of outboard power. The launch of the 43z, and its sistership the 35z, represent the most advanced level of a new and rapidly growing category of boat, the Outboard Express Cruiser. Boaters who now own outboard-powered center consoles, but are looking for more comfort underway and at anchor, can have both in MJM’s two new entries. The new 43z with triple outboards features speeds to 50 mph, go-anywhere shoal draft, responsive handling and low maintenance. And that is now paired with those features MJMs are noted for: all-weather cruising comfort in an offshore capable, quality-built yacht. The result? Going to the beach becomes a far more pleasurable weekend experience. Anchored bow out, engines up, with stern beach anchor, the new 43z becomes a virtual beach cottage with all the comforts just a few feet from the sand. Boaters will love the technological and control advances of the 43z’s triple Mercury 350 hp Verados with joystick piloting, Skyhook autopilot, low maintenance costs, easy pre-flight checks, and quiet running.This bundle of owner benefits is enhanced further by the roll-stopping, optional Seakeeper 5. The longevity and quality of an inboard boat is often defined by engine life, while that of an outboard boat isn’t, because it’s no big deal to clamp on a new outboard. That means the epoxy composite 43z, built lighter and “Boston Strong” by Boston BoatWorks, will hold its value and be around for a long time. A Zurn- designed hull provides a smooth 3.5:1 length-to- beam running surface you will appreciate from the moment you take the helm until the moment someone pries your fingers from the wheel. MJM 43z is the outboard version of what many say is the best all-round express cruiser on the market, th eIPS-powered MJM 40z. 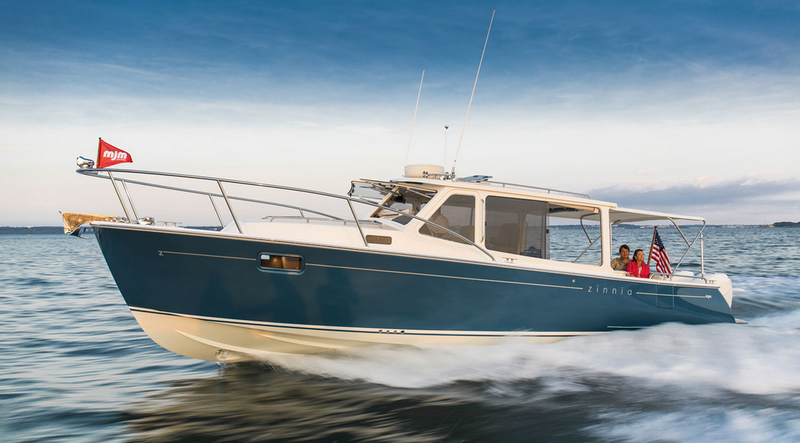 To create the 43z, the proven hull was extended to 42’ 7” with a robust outboard propulsion platform. LOA with engines and anchor roller is over 46 feet. Like all MJMs, the 43z is well and functionally outfitted. On deck, all finishes are kept hose-and-go simple. The Esthec decking feels great underfoot and while adding a warm styling element, adds nothing to maintenance requirements. There are side-boarding doors at floating dock height for easy access onto a flush deck that is without obstacles from transom to helm. Opening windshields, windows and hatches are there for the times you want the wind in your hair. When enclosed, the bridgedeck has great lounging space with a view from every seat—heat or air conditioned to your heart’s content. Belowdecks, there is a good working galley for life aboard, a big comfy island berth for two and a head toport with separate shower with seat to starboard. Cabin decor is in classic Herreshoff style, accented incherry that will remind you fondly of the brand’s New England roots. MJM introduces what other outboard brands have sought to achieve… a combination of performance and comfortable, all-weather family boating in a stunning design having great versatility. 35z’s fuel efficiency, 1.2 mpg @ 35 mph cruising speed with twin 300s. There are two explanations: MJM’s unique wet pre-preg, post-cure, epoxy composite construction for a stronger, lighter and longer-lasting hull; and a seakindly Zurn-designed modified deep-V hull with a greater waterline length-to-beam ratio of 3.5:1, versus a more typical 2.7-3.0 ratio. Another welcome trait is the absence of chine-walk at speeds approaching 50 mph… proven on MJM’s earlier 29z with twin 250s. This hull shape gains stability the faster it goes as lifting strakes and chine flats redirect wave and wake energy into effective stabilizing forces. MJM Yachts incorporates power windshields as standard equipment. MJM Yachts Florida at the St. Petersburg Power & Sailboat Show. Please feel free to reach out to us with any questions you might have or to request a demonstration of these best in class boats.